Annual: Grows up to 20 inches tall; basal leaves deeply pinnately lobed, 2 to 8 inches long. 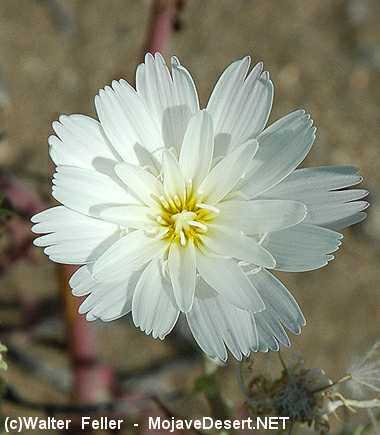 Fairly weak, branching hollow stems and showy white flowers with pink violet stripes on the underside of petal (ray flowers). Often seen growing up through the branches of other shrubs and using them as nurse plants for support. Prefers gravelly and sandy desert soils common in creosote bush scrub and joshua tree woodland.